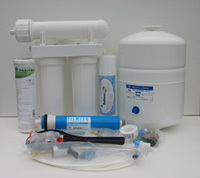 High quality reverse osmosis system designed for city or town water. RO water has applications in areas such as laboratories, health & medical and home based manufacturing. Reverse osmosis water is not recommended for drinking. The cartridges will reduce sediment and organic chemicals. The RO section has a 225 L/day cartridge. Includes an isolating valve, pressure limiting valve and 10 litre tank. A chrome tap and fittings for mounting on a sink are included. Use this filter system where the primary concern is chemicals and metals. It will also remove most bacteria.